Search EMDR Training FAQ Somatic EMDR Workshops FAQ What is EMDR Therapy? Do I need to be a “EMDRIA Certified EMDR Therapist” to practice EMDR Therapy? In order to practice EMDR Therapy, you will first need to obtain an “EMDR Training Certificate of Completion.” Once you have completed the full EMDR Training, you can practice EMDR under your license. The EMDR Training offered by the Maiberger Institute will prepare you to practice EMDR Therapy. After completing EMDR Training, you may go onto become an “EMDRIA Certified EMDR Therapist” which requires additional client sessions, consultations, and training. You do not need to become an “EMDRIA Certified EMDR Therapist” in order to practice EMDR Therapy; you just need to complete EMDR Training and receive a “Certificate of Completion” to begin practicing EMDR Therapy. What is the difference between receiving a “EMDR Training Certificate of Completion” versus becoming “EMDRIA Certified EMDR Therapist”? Upon completion of EMDR Training, you will receive an “EMDR Training Certificate of Completion” from the Maiberger Institute. This means you have been trained to practice EMDR Therapy, and you will be able to join EMDR International Association (EMDRIA). Have license/certification/registration to practice independently as a mental health professional. Click here for more information on how to become a “EMDRIA Certified EMDR Therapist.” You can also visit EMDRIA.org for more information. Click here for EMDR Advanced Workshops offered by the Maiberger Institute for CEU credits. It is highly recommended that you have a reliable pool of clients and practice people prior to or at the time of your EMDR Training. Those who take the training that currently do not have clients, must find “practice people” to complete the training. Therapist are required to practice with at least four different clients throughout the training.More details will be discussed during Part 1. When therapists register EMDR Training, they are registering for the entire EMDR Training program as a package, which includes both weekends (Part 1 and Part 2) and 10 hours of Group Consultation. The EMDR Training program must be completed as a schedule, and cannot be split apart or mix-n-matched. Should a therapist be unable to complete the EMDR Training program in its entirety as scheduled, the therapist’s enrollment will be cancelled. There would be no refund, no transfers, and no credits. Can I attend Part 1 from one EMDR Training, but take Part 2 from a different EMDR Training? When therapists register EMDR Training, they are registering for the entire EMDR Training program as a package, which includes both weekends (Part 1 and Part 2) and 10 hours of Group Consultation. The EMDR Training program must be completed as a schedule, and cannot be split apart or mix-n-matched. Should a therapist be unable to complete the EMDR Training program in its entirety as scheduled, the therapist’s enrollment will be cancelled. There would be no refund, no transfers, and no credits. It is recommended that therapists select an EMDR Training program they can commit to as scheduled. If a training is filled to capacity, please look on the EMDR Calendar for another EMDR Training that may fit your needs, or subscribe to our free EMDR Training Newsletter for updates on future EMDR Trainings as they become available. 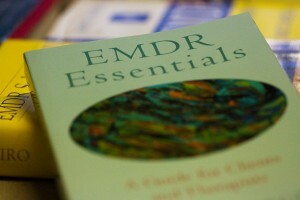 The EMDR Training Manual is password protected and is only accessible to registrants of EMDR Training. If you cannot find the email that was sent to you regarding access to required online training materials, please email the Community Manager for assistance. I can’t access the EMDR Training Videos. What is the password? The EMDR Training Videos are password protected and are only accessible to registrants of EMDR Training. If you cannot find the email that was sent to you regarding access to required online training materials, please email the Community Manager for assistance. I entered my registration and payment information, but nothing happened afterwards. What do I do? On the registration page, there are technical guidelines that must be followed in order for the form to process correctly. Your browser should be set to accept cookies, and you should turn off all pop-up blockers. Be sure to clear out your cache and browser history. After you fill out the registration form, and confirmed your information, you will be taken to the payment page. Click on the credit card icon to update the payment information. The name of the registrant must match the name on the credit card. The billing address must match the address on the credit card bill. Visa/Mastercard only. If you continue to have difficulty with registration and payment, please email the Community Manager for assistance. I entered my registration information, but I can’t read the text in the Captcha Spam form thingy. What do I do? On the Captcha window, you will see “refresh” icon (two arrows going in circles). If you click that icon, it will give you a new set of words. There is also an “audio” icon, which will speak the words to you (please turn on your speakers). If you continue to have problems, more than likely, your browser settings need to conform to the technical specification outlined on the registration page. You’ll need to turn off all pop-up blockers, and set your browser to accept cookies. If you continue to have problems, please email customer support for assistance. How do I know if I am fully trained in EMDR Therapy? Completed “Level 1” AND “Level 2”, AND received a “Certificate of Completion” for both parts AND completed all requisite Consultation Hours from an EMDRIA approved provider of EMDR Training. If a therapist has completed “Level 1” training (only) prior to 2008, the therapist is NOT considered a fully EMDR trained as approved by EMDRIA. EMDR Advanced Workshops provided by the Maiberger Institute are only open to therapists that have fully completed an EMDRIA approved EMDR Training. All therapist must provide a scanned copy of their EMDR Training Certificate of Completion to the Maiberger Institute prior to registration and payment in to confirm their eligibility. What if I am unable to attend or complete my assigned training due to extraordinary circumstances? The Maiberger Institute will review any extraordinary circumstances that may impact a therapist’s ability to attend or complete their assigned training on a case by case basis. Unless otherwise noted, the existing terms and conditions will apply. Please email us for questions regarding registration, payment, and cancellations.